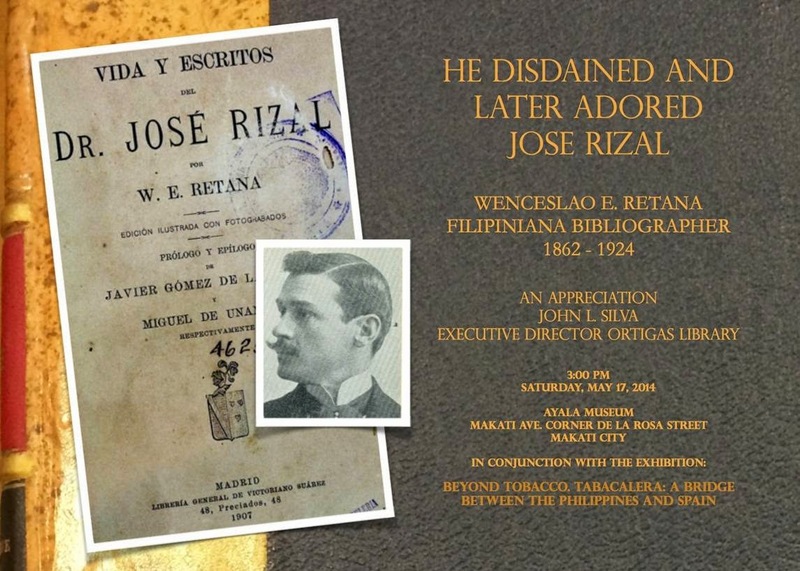 The Ortigas Foundation Library holds an Art Appreciation Talk by John Silva about Wenceslao E. Retana (1862-1924), a Filipiniana Bibliographer. This will be held on May 17, 2014, 3pm at Ayala Museum located at Makati Avenue corner Dela Rosa St., Makati City. This is in conjunction with the exhibit: Beyond Tobacco Tabacalera: A bridge Between the Philippines and Spain. Wenceslao E. Retana is a Spanish and brilliant Filipiniana bibliographer. Had a large Filipiniana collection which he sold to Tabacalera which in turn sold to the National Library. Was pro-friar. Hated anyone advocating reform especially the ilustrados of La Solidaridad. Wrote absolutely mean pieces about them. One day he flips and likes everything Philippine.